• The distal convoluted tubule is also water impermeable so that continued NaCl reabsorption further dilutes the urine. • However, beyond the distal convoluted tubule, the water permeability of the connecting tubule and the collecting duct is regulated by the hormone vasopressin (antidiuretic hormone or ADH), which regulates the number of aquaporin-2 water channels in the luminal membrane of the CNT cells in the connecting tubule and of the principal cells in the collecting duct. • DCT cells in the distal convoluted tubule reab-sorb NaCl via an electroneutral NaCl cotran-sporter that can be blocked by thiazide diuretics. • The connecting tubule and the collecting duct comprise the aldosterone-responsive distal nephron (ARDN). CNT cells and principal cells in these segments actively reabsorb Na+ via a Na+ channel (ENaC) in the luminal membrane. • Principal cells and CNT cells in the ARDN also secrete K+ by K+-selective channels in the luminal membrane. Depolarization of the luminal membrane by ENaC channels and increased urine flow enhance the favorable driving force for K+ secretion. • Aldosterone increases Na+ reabsorption and K+ secretion in principal and CNT cells in the ARDN by three mechanisms: increased activity of Na+ and K+ channels in the luminal membrane, increased Na+,K+-ATPase transporter activity in the basolateral membrane, and increased synthesis of Krebs cycle enzymes. Beyond the proximal tubule, the nephron is different structurally and functionally. The proximal tubule is a bulk reabsorber—most of the filtered salt and water is returned to the plasma in this region in a relatively nonselective fashion. Therefore, the concentrations of most of the major ions and the total osmolality of the proximal tubular fluid remain approximately the same as those of the plasma. Among the major filtered ions only Cl" shows a significant change; its concentration increases as HCO" is selectively reabsorbed. Thus, the fluid at the end of the proximal tubule resembles plasma, except that it contains no plasma proteins and that most of the organic substrates have been removed by specific transporters. Only trace amounts of glucose, amino acids, and organic acids are delivered to the loop of Henle. On the other hand, other substances that have been secreted into the proximal tubule, such as para-aminohippurate (PAH), are present in higher concentrations than in the plasma. However, these secreted substances are present in such low concentrations in the plasma that their concentrations are also negligible in the tubular fluid and their contribution to its osmolality can be ignored in discussing the function of the remaining regions of the nephron. 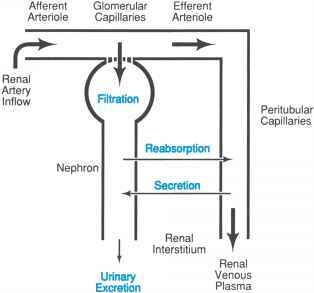 The loop of Henle and the distal portions of the nephron have specialized and tightly regulated transport characteristics that allow them to develop urine that can have a composition different from plasma. Urine osmolality can vary from one-fifth to four times that of plasma. Depending on the physiologic circumstances, the Na+ excretion rate may vary between nearly zero to more than 2% of that filtered at the glomerulus, which is called the filtered load. The thick ascending limb of the loop of Henle, the distal tubule, and the collecting duct regulate excretion of other important ions such as potassium, calcium, and magnesium. 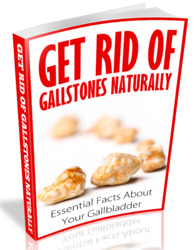 The urine also contains a high urea concentration in comparison with plasma. Furthermore, the phosphate that has been filtered but not reabsorbed by the proximal tubule is titrated by hydrogen ions that are secreted into the distal regions of the nephron, producing a final urine pH that may vary from 4.5-8.0. The following sections describe the transport processes necessary to produce urine that can vary so markedly in composition from the plasma. Later chapters discuss how the final daily excretion of the most important ions is hormonally regulated to match their daily intake.